This vent hood features a leathered appearance, given by the overall hammered finish and darkened patina, while still maintaining the original reddish hue of the 16 oz. 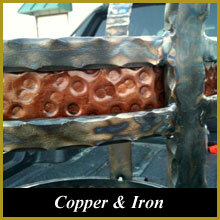 (24 gauge) copper it was crafted from. 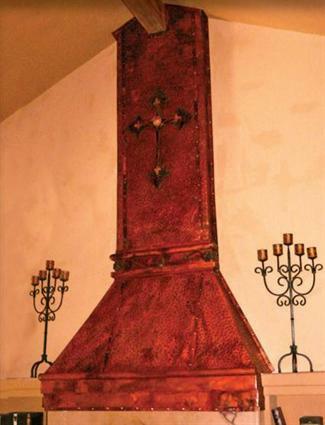 Outlined by copper strapping and buttons, and featuring cast iron scrollwork in the middle section, this vent hood combines simple details with the magnificent cross accent piece centered near the top, handmade by our very own copper artisans. This particular vent hood also features an elongated design for vaulted ceilings and has been modified to fit around exposed ceiling beams.